The officer selection process requires pilots and support officers (flight surgeon, events coordinator, maintenance officer, supply officer, and public affairs officer) wishing to become Blue Angels to apply formally via their chain-of-command, with a personal statement, letters of recommendation and flight records. Navy and Marine Corps F/A-18 demonstration pilots and naval flight officers are required to have a minimum of 1,250 tactical jet hours and be carrier-qualified. Marine Corps C-130 demonstration pilots are required to have 1,200 flight hours and be an aircraft commander. Applicants "rush" the team at one or more airshows, paid out of their own finances, and sit in on team briefs and post-show activities and social events. Rushes are asked to tell a joke prior to the brief, and graded by the team as part of the rigorous selection process. Team members vote in secret on the next year's members, with no accountability to the higher Navy authority why an applicant was or was not selected. Selections must be unanimous. There have been female and racial minority staff officers as official Blue Angel members, in support of the Blue Angels recruiting for the Navy and Marine Corps. The most recent minority Blue Angel pilot was LCDR Keith Hoskins on the 2000 team. Flight surgeons serve a two-year term, and act as the team recorder during air shows, and help oversee emergency response planning with the various air show planners. The first female Blue Angel flight surgeon was LT Tamara Schnurr, as a member of the 2001 team. The team leader (#1) is the Commanding Officer and is always a Navy Commander, who may be promoted to Captain mid-tour if approved for Captain by the selection board. Pilots of numbers 2–7 are Navy Lieutenants or Lieutenant Commanders, or Marine Corps Captains or Majors. The number 7 pilot narrates for a year, and then typically flies Opposing and then Lead Solo the following two years, respectively. The number 3 pilot moves to the number 4 (slot) position for his second year. 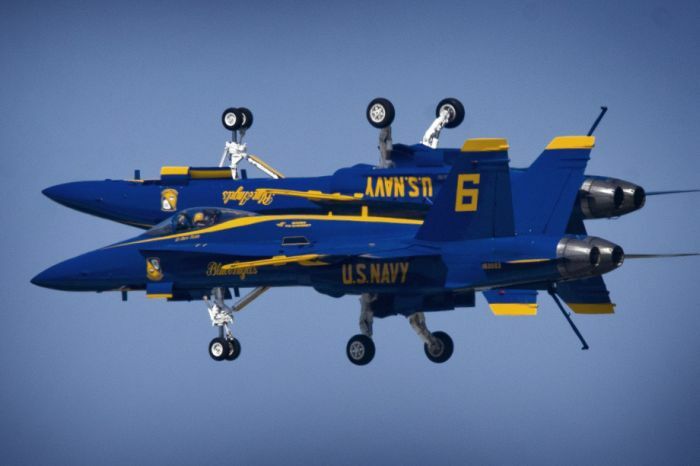 Blue Angel No.4 serves as the demonstration safety officer, due largely to the perspective he is afforded from the slot position within the formation, as well as his status as a second-year demonstration pilot. There are a number of other officers in the squadron, including a Naval Flight Officer, the USMC C-130 pilots, a Maintenance Officer, an Administrative Officer, and a Flight Surgeon. Enlisted members range from E-4 to E-9, and perform all maintenance, administrative, and support functions. They serve three to four years in the squadron. After serving with the Blues, members return to fleet assignments.